Over the past 20 years, more than 100 major sports facilities have opened in the United States to join the thousands already in operation. Throughout these sports complexes, concession stands see a great amount of traffic as fans enjoy stadium food and beverages during events. In particular, beverage hoses are a critical element in the sanitary dispensing of soda, beer and more. In the manufacturing of beverage hoses, custom yarn constructions and combinations may be required. Yarn constructions that are commonly used in this industry typically range in size from 500 to 6,600 total denier. These products are available in multiple package sizes and configurations for different types of braiding, spiral winding, and knitting equipment. 1. Increased Pressure Capabilities: Using an open, mesh polyester braiding incorporated within the beverage hose walls will offer increased pressure capabilities up to four times greater than unreinforced tubing. 2. Kink Resistance: If kink resistance is required, a standard unreinforced tubing will not perform as needed. 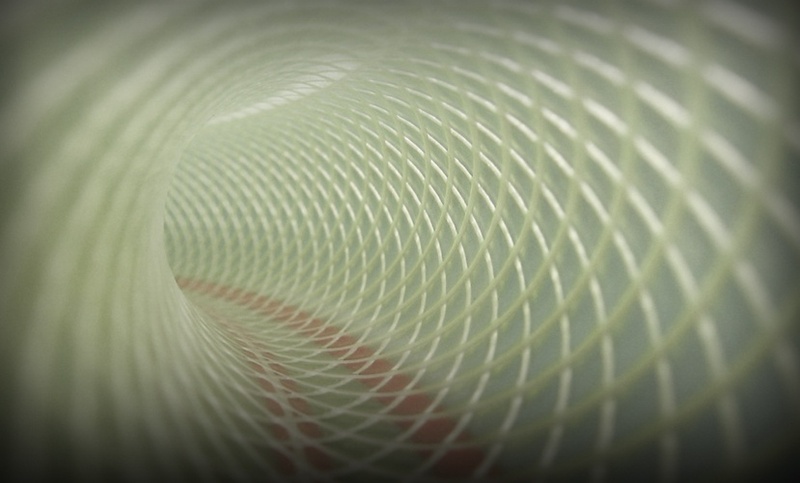 Using a braided mesh fiber as reinforcement will result in a flexible tubing that resists kinking. 3. Added Strength: Industrial thread and yarn adds superior strength while allowing for flexibility. When liquids and ingredients in the beverage industry are pumped or transported from machine to machine or machine to container, particles can get trapped within the bore of the hose that can lead to bacteria growth and pose a health risk for the consumer. Thread or yarn braiding reinforcement is contained within the tubing wall, which adds strength while creating a smooth outer and inner wall surface – decreasing risk of contamination. 4. Does Not Interfere with Visual Inspection: With beverage dispensing systems, easy visual flow monitoring is critical. Industrial thread and yarn used to reinforce tubing with mesh braiding offers all the benefits needed without impairing the visual monitoring of the system in place. 5. Lightweight with Increased Flexibility: A notable benefit of fiber reinforcement versus stainless steel wire reinforcement for beverage hoses is you get a durable tube that is lightweight with uncompromised flexibility. What challenges have you faced with hose reinforcement? Learn how Service Thread can help recommend the best yarn construction and package size for your application.